Foundation is a Godsend for many of us, and is the quick and easy route to smooth and flawless looking skin. However, there are times- for instance, when it’s warm and when you’re working- when some foundations can feel a little too heavy on the skin. Unless you’re blessed with super clear skin though, going out without foundation can feel a little daunting. If you’re not yet ready to face the world without your base, and are looking for something with light coverage, a tinted moisturiser could be just what you need. The great thing about tinted moisturiser is that it acts as a 2 in 1 solution. Not only does it hydrate skin, it can also form an important part of your beauty regime. 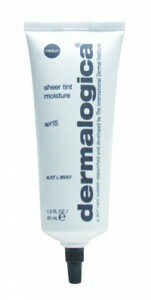 Dermalogica Sheer Tint Moisturisers are fantastic oil- free products, which not only provides skin with essential moisture and protection against the suns rays, but also a feather light sheer base. By using a tinted moisturiser, you can achieve amazing looking skin without feeling weighed down- perfect for the office and the school run!